Assets: Probable future economic benefits obtained or controlled by a particular entity as a result of past transactions or events. Liabilities: Probable future sacrifices of economic benefits that arise from present obligations of a particular entity to transfer assets or provide services to other entities in the future as a result of past transactions or events. 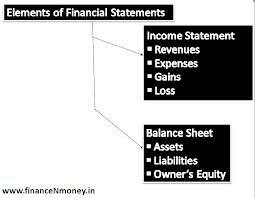 Equity: Residual interest in the assets of an entity that remains after deducting its liabilities. In a business enterprise, the equity is the ownership interest. Investment by Owners: Increases in net assets of a particular enterprise resulting from transfers to it from other entities of something of value to obtain or increase ownership interests (or equity) in it. Assets are most commonly received as investments by owners, but that which is received may include services or satisfaction or conversion of liabilities of the enterprise. Distribution to Owners: Decreases in net assets of a particular enterprise that result from transferring assets, rendering services, or incurring liabilities by the enterprise to owners. Distributions to owners decrease ownership interests (or equity) in an enterprise. Comprehensive Income: Change in equity (net assets) of an entity during a period from transactions and other events and circumstances from non-owner sources. It includes all changes in equity during a period, except those resulting from investments by owners and distributions to owners. Revenues: Inflows or other enhancements of assets of an entity or settlement of its liabilities (or a combination of both) during a period from delivering or producing goods, rendering services, or other activities that constitute the entity’s ongoing major or central operations. Expenses: Outflows or other using up of assets or incurrences of liabilities (or a combination of both) during a period from delivering or producing goods, rendering services, or carrying out other activities that constitute the entity’s ongoing major or central operations. Gains: Increases in equity (net assets) from peripheral or incidental transactions of an entity and from all other transactions and other events and circumstances affecting the entity during a period except those that result from revenues or investments by owners. Losses: Decreases in equity (net assets) from peripheral or incidental transactions of an entity from all other transactions and other events and circumstances affecting the entity during a period except those that result from expenses or distributions to owners. Which are the Functions of Foreign Exchange?